This dance was adapted from hadrah music which rich with Islam culture and a modification between the middle east and javanese. 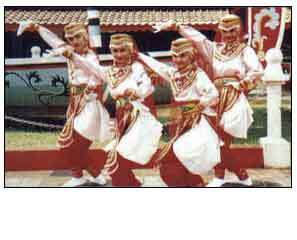 In the beginning, this dance showed the dynamic movement from the rebana (some kind of percussion) players only. In 1990 some of the dance coreographers in Surabaya, Gersik and Sidoarjo joined the dynamic movement into a dance which danced by a group of dancer with rebana and jidor music as a background. This dance filled with wisdom phrase and glorious song to God. Hadrah music usually used as a background in a wedding or cultural ceremonies, this dedicated to thank God for all the blessing. The hadrah dance is very attracting because its combine of the dynamic movement and sound.